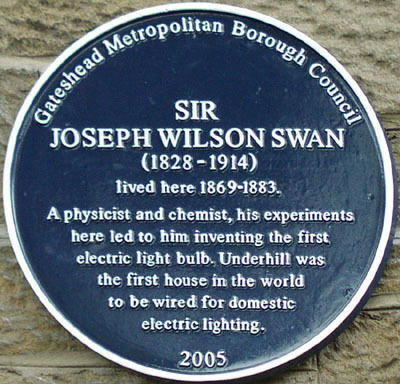 Sir Joseph Wilson Swan demonstrated and patented the first practical electric lamp in 1878. Swan was born in 1828 at Pallion Hall in Bishopwearmouth (now Sunderland) Northumberland, England and he served an apprenticeship with a pharmacist there. One of the first to produce electric light was made in the 18th century by E.Kinnersley and later by Humphry Davy, an English scientist. He experimented with electricity using an immense electric battery. When he connected wires to his battery and a piece of carbon, the carbon glowed, producing light. But this was more like an electric arc than a lamp. Much later, in 1850 the English physicist Sir Joseph Wilson Swan began working on a light bulb using carbonised paper filaments in an evacuated glass bulb. By 1860 he was able to demonstrate a working device, and obtained a UK patent covering a partial vacuum, carbon filament incandescent lamp. However, the lack of a good vacuum and an adequate electric source resulted in an inefficient bulb with a small, uncontinued lifetime. 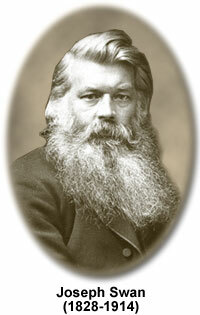 Later Joseph Swan was determined to devise a practical, long-lasting electric light. He found that a carbon paper filament worked well, but burned up quickly. In 1878, he demonstrated his new electric lamps in Newcastle, England. Swan pursued his search for a more durable filament, he decided to use cotton to produce "parchmentised thread" and obtained British Patent 4933 on 27 November 1880. His home was the first house in the world to be illuminated by electric light. In 1880 Mosley St. in Newcastle had electric lighting and Lord Armstrong's mansion had electric lighting in November 1880. On December 28th 1881 Swan's electric lighting was used to light the stage of the Savoy Theatre. It took many small steps by several inventors to find the right formula for the electric light bulb. 1761 : Ebenezer Kinnersley from Gloucester experimented with electrostatically charged capacitors to heat a wire to incandescence. 1802 Humphry Davy used huge batteries to pass current through a thin strips of platinum. 1835, James Bowman Lindsay demonstrated a constant electric light at a public meeting in Dundee, Scotland. 1840, Warren de la Rue used a platinum coil in an evacuated tube. 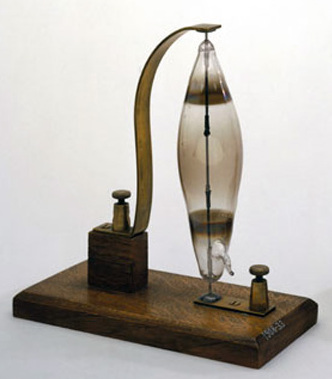 1841 Frederick de Moleyens had first patent for an incandescent light in a vacuum bulb. 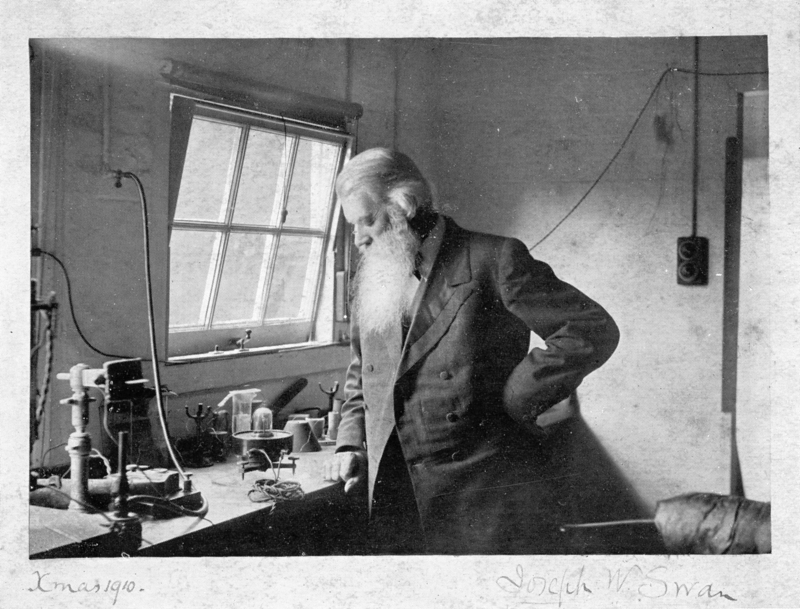 Joseph Swan in his lab. Swan is also remembered for his contribution to photographic developing processes. He noticed that heat increased the sensitivity of the silver bromide emulsion. He later patented bromide paper, developments of which are still used for black and white photographic prints. Swan was knighted in 1904.